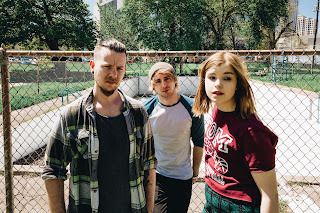 False Advertising have just released an EP entitled I Would Be So Much Happier If I Just Stopped Caring, a compilation of the singles they've released through 2017. We caught up with Jen, Chris and Josh for a chat about the EP, becoming an advert for Mobike and their plans for 2018 and new songs. You've just released an EP called I Would Be So Much Happier If I Just Stopped Caring. It's a bit of a mouthful, how did you decide upon the title of it? Josh: I suppose it is. If you think about it, there's no real way of shortening the title without it losing sight of it's meaning, so we just decided to stick with it. Chris: It's a bit tongue and cheek really. Jen: Mark Radcliffe seemed to find the title amusing when he read it out on the radio, so I think we've succeeded in our aim of having something that is serious sounding, but at the same time doesn't take it's self entirely seriously. And you're releasing it on limited edition cassette at your shows. Will there be other formats available at some point? Josh: We did a limited edition run of our debut album on cassette two years ago and people loved it. So this time we thought why not do it again but give people download cards too, that way you can actually listen to it. Chris: It's available digitally in the usual ways though, so it is out there. You've worked with a number of people this year in the making of these songs. How much of a change was it to have other people involved in the recording process? Josh: Not as alien as I thought it was going to be. Whether we've recorded by ourselves or with other people the goal is still the same; to get the best song we can at the end. When we go to record a song its usually about 90% written so getting an outside view can be really beneficial. Chris: It definitely helped us to focus on the creative side more, and worry about the technical side of recording less, which was good. Jen: I found it amazing that there were people outside of the three of us that actually wanted to work with us! Given that a lot of the people we collaborated were donating their time for free too, it was very heartening and we're incredibly grateful to them as we've learned a lot. Did it alter your approach in any way and is it something that you'll continue to do? Chris: It did not alter the way we write really, it did give us access to better equipment, recording spaces and expertise. Jen: We tracked live for the first time on two of the tracks. We've never been able to do that in the past due to us recording DIY, so I don't see why we wouldn't do that for everything in the future if we could get away with it. The other thing about working in studios which seemed really weird to me was how much easier it is to play better. That seems like a odd thing to say, but when it's just you in a tiny practice room pressing record you have a tendency to mess up more. Josh: That said, we also learned that what we've been able to achieve on our own actually has it's merits. The EP is about 50% recorded with other people and 50% DIY, and you can tell in a way, which has it's charms. You filmed a video for Hey You off the EP cycling around Manchester. What gave you the idea to do that? Jen: We seem to be good at coming up with semi-comical meta-ish video concepts. This was one of them, it stuck because the struggle in the video seemed to fit with the sentiment of the song. Josh: We needed to come up with something that had no budget, and we could do without traveling anywhere. Originally we were thinking of trying to do a Mario Kart style bike race, but then we remembered that none of us actually own bikes. So Mobikes were used out of necessity more than anything. Chris: Mobike was a new thing in Manchester at the time too, so it seemed like a good shout. Jen: Mobike actually recently tweeted about our video - so it's like we accidentally made them an advert or something haha. Chris: I decked it whilst riding through a corridor in a mill, this should be on the blooper reel. Jen: Chris turned up to the shoot really hungover, so it was pretty touch and go with him for most of the morning actually. Josh: I had to pretend to fall off my bike in the video. Turns out, that faking falling off your bike is actually really tricky, and it probably would have hurt a whole lot less if I had genuinely fallen off. Could you tell us a little about the lyrics on It's Been A While (So Sick)? Jen: That track was recorded as part of a compilation album called Three Minute Heroes for Warren Records over in Hull, the aim of the record is to give young people the confidence and opportunity to say whatever they feel without needing to overthink how it's going to be percieved by people. So we were donated a bunch of anonymous creative writing pieces from these kids to work with - two of which went forward to become the lyrics of It's Been A While. Chris: We all really like the lyrics, it definitely brought something fresh to the track that we couldn't have done ourselves. How did your involvement in the project come about? Jen: Stew from Life (the band) who was masterminding the project over at Warren Records asked us, we'd played in Hull a few times before that came about so I'm sure that might have been how he came across us, maybe? We were chuffed to be asked anyway. What are your plans for 2018? Can we expect to hear a second False Advertising album? Jen: It's impossible to say for sure right now but I want to make a new album soon more than pretty much anything in the world. We've already written about 30 songs collectively and now the tour is over honing the new material will pretty much become our primary focus. We always start writing independently then start collaborating once we've all got our ideas together, so I'm looking forward to that. Chris: It's been long enough that we have forgotten how much an album takes out of you. Hopefully we will make it out of the other side in one piece. False Advertising play Band On The Wall in Manchester on December 12th with Everything Everything and January 12th (2018) as part of Shell Zenner's Amazing Radio night.